I'm glad you're doing better, Kelly. Keep your spirits high and you'll be out throwing soon. Hey man you should make plans to come out to a triple tournament at stubb Stuart on the 26th three headed Turkey"! Is that your First Ace,Dude?? Congrats!! Nice meeting you and playing with you at NB Dubs! Hopefully you make it for more! 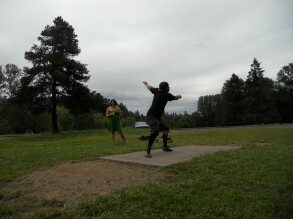 If you are Facebook can you search for North Bonneville Disc Golf and post your thoughts about our course? Hit me up when you come out to Bonneville! Thanks Kelly your so awesome! No problem Kelly. Glad to give you a hand. I'll call when we get on 212 from 205.Will that give you enough time to get to Space-Age? See ya around 10:30ish. I think we'll be going right by there Kelly. I'll give yu a call before we get close and see about getting you to the Tag round. You happen to have my singles score from that day as well? Was a +3 I was pretty damn happy with. on 1/8 at Riverbend/Milo Mciver you had 118 total strokes on 27 pro tees.